Tiny diamond-coated drill bits can be used in precision applications from dental implants to drilling holes in circuit boards. In 3D printers, these diamond-coated parts can remove material more precisely, creating detailed objects with finer spatial resolution. For the U.S. Department of Energy's Argonne National Laboratory, diamond technology has been a gem of an idea. Nanocrystalline diamond-related (NCD) devices developed by Argonne nanoscientist Anirudha Sumant garnered Argonne two of the 2013 R&D 100 awards. Nicknamed the "Oscars of Innovation," the awards recognize a year's most important scientific and technological breakthroughs. The winners include the Miraj Diamond platform, a manufacturing process developed with AKHAN Technologies, Inc., and the Nanocrystalline Diamond Technologies NCD Plus coating, developed with NCD Technologies. With these awards, Sumant becomes the first Argonne scientist to win two R&D 100 awards in the same year. In all, he has now won three R&D 100 awards, all related to his work on nanocrystalline diamond. Argonne's NCD technologies rely on incredibly small diamonds and can be used for mechanical, biological, optical, electronic and electrochemical applications. The Miraj Diamond platform resulted from the marriage of two scientific breakthroughs: the ability to deposit nanocrystalline diamond films at relatively low temperatures and a doping process that makes NCD into a good semiconducting material. Sumant and his colleagues developed the low-temperature NCD deposition technology at Argonne's Center for Nanoscale Materials, while the doping technique was developed at AKHAN Technologies, an industry partner based in Illinois. 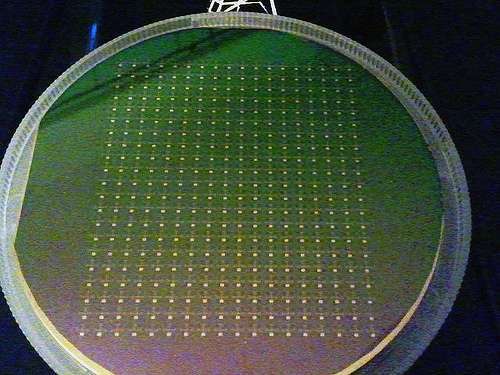 These technologies together will allow manufacturers to create better integrated circuits for telecommunications, defense and aviation electronics. Rather than create diamond films with traditional methods that require extraordinarily high temperatures and pressures, the technique developed at Argonne can deposit a thin diamond film at relatively low temperatures of around 400 degrees Celsius. This technique requires only an activation medium like plasma, argon gas and a carbon source, such as methane. The gas is ignited and forms small diamonds that grow on a wafer, producing a continuous thin layer. The Miraj Diamond platform resulted from the marriage of two scientific breakthroughs: the ability to deposit nanocrystalline diamond films at relatively low temperatures and a doping process that makes NCD into a good semiconducting material. Although diamond is ordinarily an excellent insulator, it can be altered in a process called "doping" to become a semiconductor, an important component in many different electronic systems. AKHAN has created a new technique that makes the doping process much more efficient. Thanks to diamond's many useful properties, the Miraj Diamond process may have wide applications in electronics. Diamond has five times the thermal conductivity of copper, which allows it to act as a heat sink and shuttle heat away from electronic components. Diamond films can also be used in power devices, because diamond can carry a high amount of current. "With these attributes, diamond films have the potential to revolutionize the semiconductor industry," said Sumant. Sumant's partnership with AKHAN was forged when Adam Khan, founder and CEO of the company, approached Sumant after a conference talk. AKHAN now uses Sumant's deposition technique in their manufacturing processes, and intends to expand its use to all its low-temperature diamond processes and an additional range of products through a joint agreement between AKHAN and Argonne. The second award is for a nanocrystalline diamond coating for micro-tools. Sumant originally developed the technology at the University of Wisconsin-Madison with Patrick Heaney, a former student there. This technique uses hot filaments to deposit coatings of diamond a few tenths of a millimeter thick. The thin layers of diamond protect and strengthen micro-size cutting tools, extending their working lifespan while preserving their precise geometry. 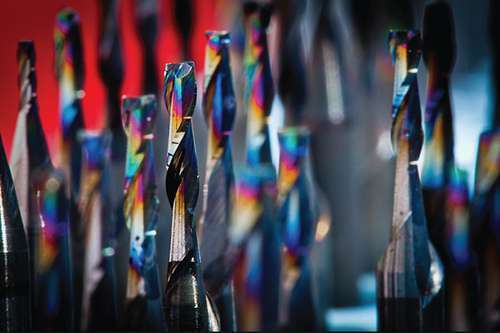 This technology is now being used by NCD Technologies, a company Heaney started to produce NCD-coated micro-drills. The coating technology was patented by Sumant and licensed by Intel. This technology is especially useful in applications that require intricate machining. Tiny diamond-coated drill bits can be used in precision applications from dental implants to drilling holes in circuit boards. In 3D printers, these diamond-coated parts can remove material more precisely, creating detailed objects with finer spatial resolution. Sumant is an expert in carbon-based materials, including diamond, carbon nanotubes and graphene. His interest in diamonds can be traced back to his days as a Ph.D. student at the University of Pune in India, in the 1990s. Diamond research was booming, and James Butler, diamond expert at the Naval Research Laboratory and later Sumant's collaborator, gave a talk at a workshop at Sumant's university. Sumant recalls that Butler placed a sparkling, transparent diamond wafer on the overhead projector, a sight that fascinated him. Ever since, he has studied the synthesis and fundamental properties of diamond, carbon nanotubes and, recently, graphene, as well as their applications in industry. Sumant sees the R&D 100 awards as valuable proof that his work is important not only for science, but for industry and society as well. "Whenever you do research, especially basic research, you have to keep in mind that your research should ultimately improve the quality of human life," Sumant said. "That's important to me."